2. Season in oil the asafoetida, add ground paste and stir on low heat till almost done (when all the moisture would have evaporated). Remove from fire, add chopped coriander, mix well, cool and make lemon sized balls, set aside. 1. Take out extract of tamarind by boiling it in hot water. Add 2 1/2 – 3 cups of water, salt, turmeric powder, curry leaf and the prepared rasam powder, set to boil. 2. When rasam starts to boil, add the prepared balls gradually, one at a time, so it does not break. Allow to simmer for a while. 3. Season ingredients in ghee/oil add to rasam, along with chopped coriander. 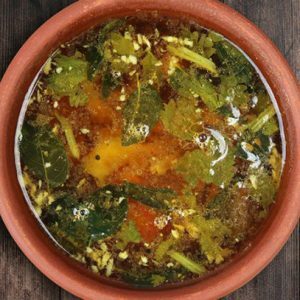 Feel free to comment or share your thoughts on this Paruppu Urundai Rasam Recipe from Awesome Cuisine.